I’ve finally gotten around to doing some maintenance updates on three of my most-used bits of software (JSONView, XBList, and TopProcess), all in the last couple weeks. Now that they’re all approved and live, I thought I’d summarize what’s changed. 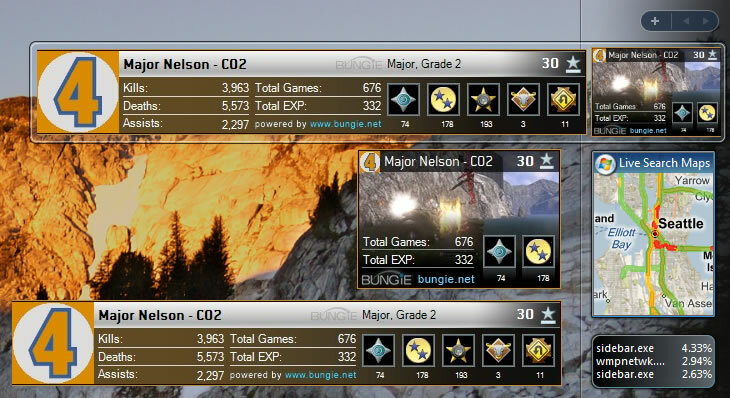 Halo 3: ODST was released a couple weeks ago, and Bungie redesigned their site a bit to include ODST info in your Service Record. This included changing the pages just enough that XBList got confused trying to figure out emblems for people who had never played Halo, and started showing the wrong emblems for those people (only if you prefer Halo emblems to Xbox emblems, which isn’t the default). Not a huge bug, but I took the opportunity to clean up a bunch of stuff in XBList and put out a little release. In addition to the Halo emblem fix, I fixed a bug where your settings could get corrupted and you wouldn’t be able to start XBList. I also cleaned up the menus and settings, consolidating the Halo links into one item, and removing the option to choose a custom notification sound or turn off debug logging. The debug log is much easier to get to if you’re having trouble - previously I had people dig through their Application Data folders for the log, but now there’s an item in the Help menu that opens the debug log directly. Paired with some much more detailed logging, I should be able to fix future problems much more easily. I also changed the system tray icon to bring XBList to the front on a single click rather than a double click, since that feels much more natural in Windows 7. Lastly (and probably not too importantly for most people), I’m storing emblems in your local Windows profile now, instead of the roaming profile. For the few people who use XBList and have roaming profiles enabled, this should save you some sync time. Anyway, you should have been prompted to update when I pushed the update two weeks ago, but if you haven’t gotten it yet you should download and install it now. I still have plans for a major overhaul of XBList, but it’s low on my list of priorities - XBList is still pretty popular, but not as much as it used to be, with maybe 5,000 active users. This last update has been a long time coming. Ever since I installed Internet Explorer 8, the TopProcess sidebar gadget has been randomly crashing. I’m not sure what changed in Internet Explorer to make it screw up every so often, but it does. However, it only crashes after running for a few days, so for months I’ve been tweaking the code a bit, then waiting until it crashes, then tweaking some more, rinse, repeat. I’ve finally nailed it down to the point where crashes are very rare, and then I added some code that automatically resets the gadget when it crashes. So you should never see it mess up again. There is also a gadget log file in the gadget’s install directory that I’m using to store errors, so it should be easier to troubleshoot in the future. Lastly, Jean-Pierre van Riel contributed a patch that added IO tracking to TopProcess, so there is now a third way to view your processes. This view shows you the total IO usage (combined bytes in and out, per second) which seems to cover both disk and network access. Get the update from me or from Windows Live Gallery and be sure to rate the gadget. I’m excited to see that it’s been downloaded over 100,000 times from WLG (plus who knows how many downloads from my site). In CPU mode it displays percentages, and in RAM mode it displays absolute memory footprint values. Remember that some apps (like .NET or Java apps) look like they’re taking a lot of memory, but will give it back when you get low on RAM, so it’s not a worry if they gobble up some extra RAM when you’ve got it. Of course, for most native apps (like Firefox or Photoshop), the value displayed in TopProcess represents a less flexible chunk of resources. A couple of bugs and less-than-desirable behaviors have been fixed, too. Whenever you change settings the changes will be reflected in the gadget immediately, and turning text fade off and then on again won’t cause text to overlap in a big mess. Also, some of the comments on the Windows Live Gallery page for TopProcess suggest that people have been seeing performance problems with the gadget. I haven’t actually seen any problems myself, but I went through the code and tightened it up a bit here and there - hopefully it’ll work better for those people. So pick up the new version, rate it on Windows Live Gallery, and enjoy the new functionality. PS: I was holding this back until my friend could come through with the Russian and Japanese translations, but he’s just too busy and I had to fall back to Google Translate. I apologize if the translations are awful. If you would like to help fix them, or to translate TopProcess into your favorite language, please contact me. Just a quick update on the Top Process Windows Sidebar Gadget I made a couple months ago. First, I’ve added an option to disable the crossfade effect whenever the list of processes is updated. When this setting is checked, there’s no more smooth fade, but your text is also not bold. I actually prefer it without the fade, and based on some feedback I’ve gotten, this will be a welcome change. The second change is that Top Process has been translated into 3 more languages. This is the first software I’ve ever written that has been localized, and I’m super excited, even though there wasn’t that much to translate. User Stefano Pirovano contributed an Italian translation, and my multilingual college buddy Mitch provided Japanese and Russian translations. If anyone else wants to take a crack at it, just email me. Hopefully some of my .NET stuff can be ready for localization at some point too. Last weekend I decided that I would try my hand at developing a Windows Sidebar Gadget. I’ve got a few ideas about gadgets that I’d like to make, so I thought I’d whip up a quick, useful gadget to get familiar with the platform. I ended up making the TopProcess gadget. It’s basically a version of the standard UNIX top command. It’ll show the top X processes on your computer, which are the processes taking the most CPU. It just sits there in the sidebar updating that list every few seconds, letting you know what’s chewing up your dual cores. You can grab it from me on my new Sidebar Gadgets page, or from Windows Live Gallery. If you like it, please rate it or review it on Windows Live Gallery, so more people get to see it. TopProcess is pretty simple. It uses WMI, which is very straightforward, to get the kernel and user time for each process on your system, figures out the difference in times between now and the last time it looked, sorts them, and displays the top X (configurable) on the gadget. I got a little fancy with the display side of things, making the text fade between updates, and making the gadget scale correctly when you change the number of processes to display. As an example of how frustrating it was to make this gadget, take the feature of fading text. This should be simple - the new text fades in while the old text fades out. Immediately I was hit by a problem - Internet Explorer doesn’t support the opacity CSS keyword. So I had to insert a filter key that put on some crazy DirectX filter on the text. The most immediate effect of this was disabling ClearType on the text, and inexplicably bolding my font. I still can’t explain this. Frustrated with my subpar text rendering, I turned to the gText object. It took me lots of searching just to figure out that, unlike gBackground, there is no corresponding HTML element for gText. It must be created, in script, from gBackground. So I made myself a gBackground, and struggled for a while before realizing that it’s essentially a stunted version of the canvas object in HTML5. So I needed a gBackground that spanned my whole gadget. But I didn’t have a single background image for the whole gadget - I intended to compose the background of multiple images, so it could scale correctly with more or less processes displayed. gBackground requires you specify a single image before you can add more images onto it. So I had to make a 1px by 1px transparent PNG that I stretched over the background of the gadget. Remember doing that from the old days with table-layout HTML design? It brings me back. Anyway, now I could add my gText objects. These guys do support an opacity property, and after working out how to track them between updates (they aren’t included in the DOM), I had replicated the fading behavior that I had done with HTML. The result? Exactly the same. Except it’s harder to use gText , and there’s no way to remove gText objects once you’ve added them to a gBackground unless you remove all the objects on the gBackground. It’s really nuts. I ended up rolling back all my changes and just going with the HTML fading. Sorry about the awful font rendering, but I think at this point it’s not my fault. There are more problems with the Sidebar platform of course. For example, in the manifest for a gadget there’s a way to specify your copyright, but no way to link to a license. I know Microsoft is starting to get Open Source - they should understand that licensing is important. And if they want people to be able to find new gadgets for their Sidebar, Windows Live Gallery is not the way to do it. It suffers from the same confusion as all the Live products, including Live Spaces gadgets on the same page as Sidebar gadgets without really indicating which is which. It’s just really depressing that the Sidebar ended up being such a lame feature. I remember the coverage before the “Longhorn reset” that promised the Sidebar as a unification of the disparate notification methods in Windows, replacing the system tray as well as providing hosting for mini WPF applications. Instead we get a lame reimplementation of Yahoo! Widgets or Apple’s Dashboard, without any polish or documentation. It’s really just sad. After some searching, I learned two things. The first is that if you’re running 64-bit you can’t use the standard ODBC Data Source Administrator in Administrative Tools with MySQL. You’ve got to go to C:\Windows\SysWOW64\odbcad32.exe and set up your DSN, if that’s your thing. The other thing is that the MyODBC driver is 32-bit only. So to use it at all, you need to make sure you’re calling it from 32-bit apps only. 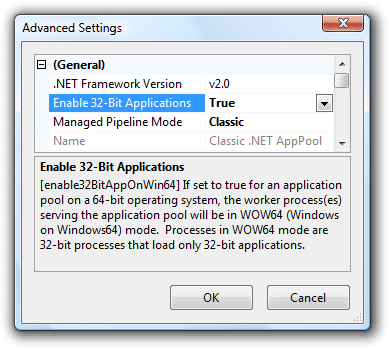 That means you’ve got to tweak the Application Pool you’re using to run all its ASP.NET applications as 32-bit. To do this, go to Administrative Tools > Internet Information Services (IIS) Manager (or just hit the Windows key and type “IIS”). Then go to “Application Pools” and select whichever application pool your ASP.NET app uses (or create a new one just for your MySQL apps. Click “Advanced Settings…” and set “Enable 32-Bit Applications”. Now the AppPool will use the 32-bit .NET CLR to run your app, and it’ll be able to see your MyODBC driver (whether you use a DSN or not).